WEDNESDAY, Aug. 6, 2014 (HealthDay News) -- Older adults with too little vitamin D in their blood may have twice the risk of developing Alzheimer's disease as seniors with sufficient levels of the "sunshine vitamin," a new study finds. The research -- based on more than 1,600 adults over age 65 -- found the risk for Alzheimer's and other forms of dementia increased with the severity of vitamin D deficiency. But the findings aren't enough to recommend seniors take vitamin D supplements to prevent mental decline. "Clinical trials are now urgently needed in this area," said study researcher David Llewellyn, a senior research fellow in clinical epidemiology at the University of Exeter Medical School in England. Another expert agreed. "This shows you there is a link between vitamin D and the development of Alzheimer's," said Keith Fargo, director of scientific programs and outreach for the Alzheimer's Association, one of several funding sources for the study. "What it doesn't show you is that [cause-and-effect] link." Whether dietary changes or getting more sun exposure would help isn't known, Fargo said. "We don't know if increasing vitamin D levels would decrease the risk of Alzheimer's," he added. Published online Aug. 6 in the journal Neurology, this is believed to be the largest study yet to find an association between low levels of vitamin D and dementia. Vitamin D is essential for maintaining bone health. It is also thought to moderate cell growth and help control immune function and inflammation. Vitamin D can be obtained through food, through the skin after exposure to sunlight and from supplements. Dementia describes a decline in memory and thinking that interferes with daily life. Alzheimer's is the most common form of dementia in old age, affecting about 5 million Americans, according to the Alzheimer's Association. For this study, researchers looked at mentally healthy men and women who participated in the U.S. Cardiovascular Health Study between 1992-93 and 1999. Their blood samples were collected at the start, and their mental status was assessed roughly six years later. 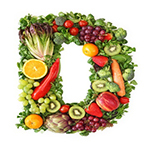 Participants' vitamin D blood levels reflected vitamin D from food, supplements and sun exposure. Dietary sources include fatty fish such as salmon, tuna or mackerel, as well as milk, eggs and cheese. During the follow-up, those with low levels of vitamin D were about 1.7 times more likely to develop dementia than those with normal levels. Those with severely low levels were about 2.2 times more likely than those with normal levels to develop dementia, the study found. The results echo some findings from other, smaller studies, Fargo said. "What's important about this study is the large number of participants," he said. Experts disagree about the best blood level of vitamin D. In this study, risk for dementia and Alzheimer's significantly increased below a threshold of 50 nanomoles per liter (nmol/L), the researchers said. Exactly how low vitamin D may be linked with dementia isn't known. Experts speculate that the vitamin may clear plaques in the brain linked with dementia. This has been shown in the lab, Fargo said. Vitamin D deficiency has been linked with brain atrophy as well, according to background information in the study. Until more research is in, Fargo recommended that people ''try to eat a brain healthy diet," which is the same as a heart-healthy diet. That includes foods low in fat and cholesterol. Getting regular physical activity and keeping blood pressure under control are other good measures, Fargo said.